Curtain ring with metallic eyebolt included. Available in 2 sizes Big total measurements 6.5 cm diameter 1 cm thickness Small total measurement 4 cm 0.8 SOLD IN BAGS OF 25 units. Rings moulding. There are 4 different models and they are made of beech wood. We have 2 models in Sapelly wood. Beech model measurements 11 x 1.5 cm. Measurements: 10 x 1 cm. 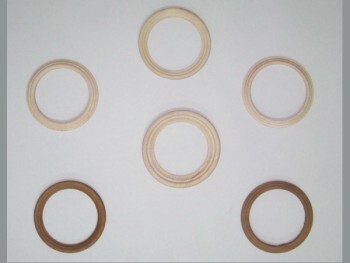 Wooden rings made of solid beech wood 2 cm thick. Available two sizes to choose from. Measure: Ring Large: 21.5 cm. ext. Ring Small Measure: 16.5 cm. ext. Wooden ring varnished wood and in walnut color. Dimensions: 35 mm. overall diameter, and 0.7 mm thick. Ideal as a way to support the large ball. Beechwood beads are ideal for lactating teethers or necklaces. Internal dimension Ø 20 mm. outside Ø 36 mm.